"Do you know what happened on the 30th of Tir?" I thought I knew the answer. 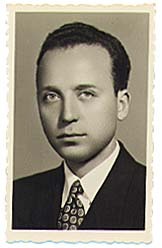 I mean, that was why I was interviewing Amanollah Tahmasebi at his Bethesda, Maryland, home; to hear first-hand about a day (July 21, 1952 )that is mentioned almost as frequently as 28th of Mordad (August 19, 1953) during political discussions about the Mossadegh era. "That's when Reza Shah resigned, or something... right?" At that moment I knew I had made a fool of myself. In the late 1940s Iran had not yet recovered from Allied occupation during World War II, the economy was in a mess and the political climate was rife with conflict between nationalists, socialists, monarchists and Islamists. Amidst all this, there was also foreign intervention in Iran's domestic politics, especially by the British and the Soviet Union. The climate was ripe for opportunists. Tahmasebi was a young official of the state railway, which at the time was one of the country's largest employers. He was in a position to see how some managers were stealing money or getting bribes in the course of lucrative contracts with foreign companies. He and a few colleagues, including Rahim Ataie and Reza Moghaddam, decided to do something about it. They formed a group to expose corrupt officials. They called their group "Hamkaran" (colleagues) but they kept the name and membership -- membership grew to about 60 at its peak -- a secret. In public, they were active through a group known as the college graduates ("Jam'eeyat-e Lisaanseh-haa") and used contacts and supporters in the Majlis and the government to uncover scandals. They also had "Hasht-e Sobh". "We thought it would be good if we had a newspaper," Tahmasebi said. "I went and got a printing permit for 'Hasht-e Sobh' (eight in the morning). But just in case they closed us down, Rahim Ataie also got a permit for 'Haft-e Sobh' (seven in the morning)." 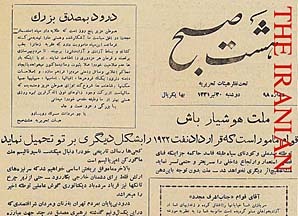 The tabloid appeared in Tehran every Thursday morning at eight; circulation 2,000. The printing cost of 120 tomans per issue was covered mostly by Hamkaran members. Its tone was strongly pro-Mossadegh and anti-British. "We had one special issue that didn't come out on a Thursday," Tahmasebi said. "It came out on a Monday, the 30th of Tir. No one was working that day and we couldn't find any one to distribute the paper, so we walked the streets and handed it to the people ourselves." I couldn't wait to hold that piece of hisotry in my hand. 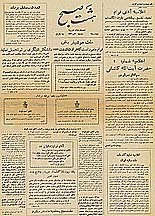 It was on that day, July 21, 1952, that word had spread that the hugely-popular Mohmmad Mossadegh had resigned in a constituional dispute with the Shah, and Ahmad Qavam had been appointed as the new prime minister. People poured into the streets of Tehran and other cities in support of Mossadegh. At least 40 people were killed in Tehran alone by soldiers loyal to the Shah. Within hours, the palace backed down, Qavam resigned and Mossadegh was reinstated. "Hasht-e Sobh" reflects the sentiments of the nationalist, pro-Mossadegh forces. It takes you to an era few remember or experienced. A time when Iran had its first democratic prime minister, who in a year, as we all now know, would be overthrown in a CIA-backed coup. We all wonder what would have happened if Mossadegh had stayed in power; if the democratic process had continued and become institutionalized. Would we have had the 1979 revolution? 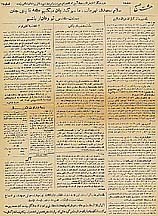 30th of Tir: What happened?